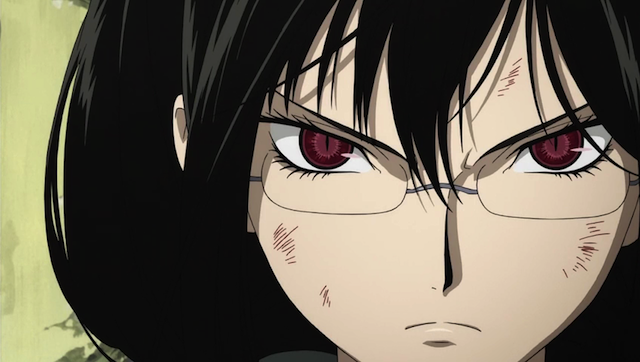 Saya tries to defend her classmates from the Elder Bairn that invaded the school, but most everybody dies. Everybody left in Saya’s class, including Yuuka, died, except for the class rep, Itsuki. 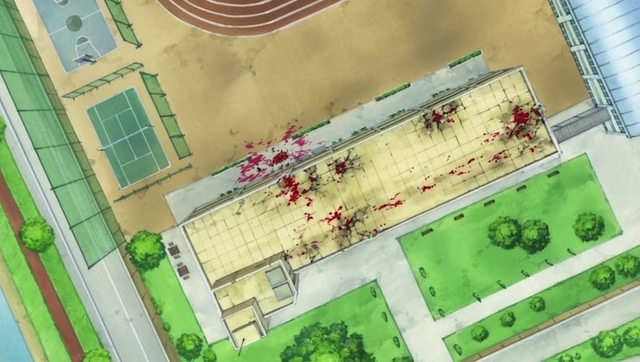 Also Tokizane hadn’t arrived yet at school when the attack started. Saya did try to defend them, but a variety of problems (including a particularly tough monster) prevented her. Mysterious sequence 1: view looking down on the school. 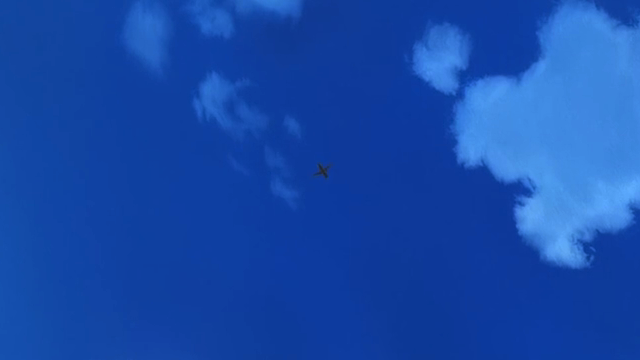 Mysterious sequence 2: airplane flying overhead. 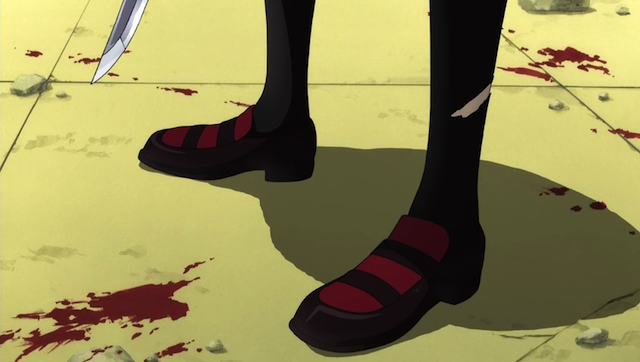 There were a lot of mysterious things, as with any episode of Blood-C, but this is one that stood out to me. The two previous screen shots were taken back to back. During the time they were shown, one could clearly hear the sound of an airplane. Is this an observer plane? It sure seems they were implying that the plane witnessed the event, or could at least see the carnage. If the plane was there to observe, that would imply that someone (perhaps an organization) is in control of the attacks. After a good cry, Saya chats with Tokizane, and starts asking some very good questions. 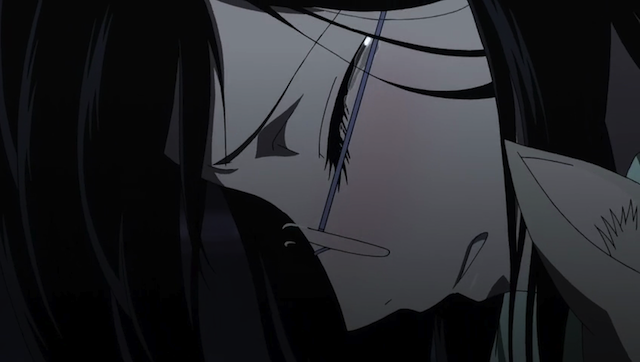 In talking with Tokizane, Saya realizes something disturbing, the school building was empty, except for the students in her class. Someone contacted the students in her class alone, seemingly knowing that they would be attacked by the monster. Was it her teacher? Did they target her class because they knew she would be there? Another excellent question (which is too say, something that I have wondered about myself) that Saya asks is how long Takizane has known her. 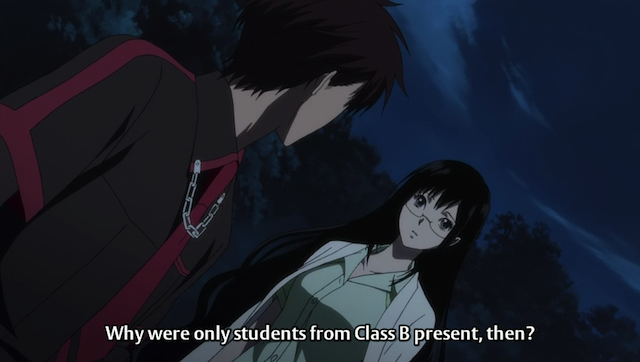 I have wondered about this since the first couple of episodes, when it was clear that Saya didn’t know her classmates. How can a high school student living in a fairly rural community not know her classmates? 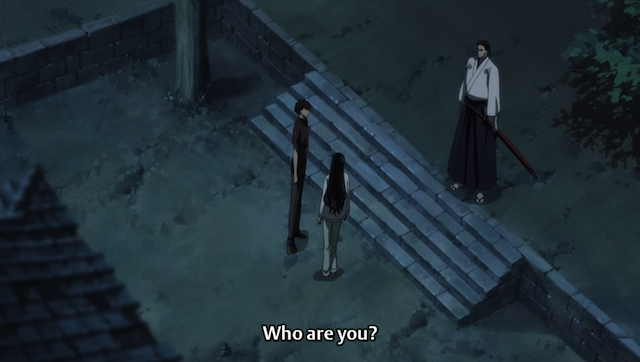 Unfortunately Tokizane doesn’t get a chance to answer her question, because Saya’s father shows up. Every guy's worst nightmare: you are talking with your girl in the moonlight, when her father arrives, carrying a big weapon.